mundane jane: Happy International Women's Day! The rest of the world has been observing March 8 as International Women's Day for 100 years. I'm willing to bet that you've never even heard of it. We just don't make a big hairy deal out of it here in the US--probably because we didn't think of it first. Instead, we designated the entire month of March as Women's History Month. Of course, you might not have been aware of that either, since there are no cards to send or decorations to string. Hopefully, you did get wind of the fact that Hurt Locker director Kathryn Bigelow took the Oscar for Best Director last night--the first time the award has ever gone to a woman. Which seems as sure a path to equality as having our own special day, I'd say. 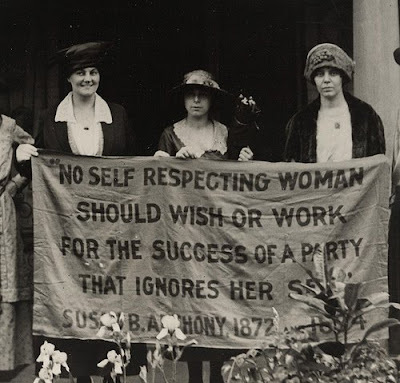 image, Library of Congress, 1920 Republican Convention. L-R: Mrs. James Rector, Ohio, Mary Dubrow, N.J., Alice Paul, N.J.
we don't make a big hairy deal about it, cuz in America, women shave! Bwahahaha. cuz if we didn't shave, we be FEMINISTS!